This apparent change in position of the near pen is an effect called parallax. It's plain to see that if you overlay these two photos to align corresponding features, you can either align the background features OR the pen. You cannot align both at the same time. Ideally, therefore, when taking the photographs for a stitched panorama you need to take all the shots from a single viewpoint so that near objects don't change their position against the background in successive shots. 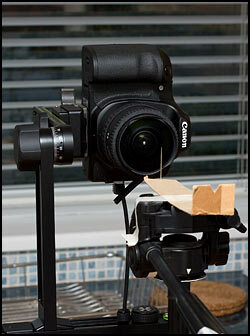 This will greatly ease the task of joining the images seamlessly to form a perfect panorama image. Hence, the "eye" of the camera needs to be kept in a constant position when the camera is rotated to point in a different direction for each shot. NB. 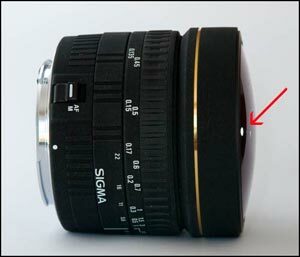 While the above applies strictly to standard rectilinear lenses, fisheye lenses don't conform exactly to this model, as explained in the note at the end of this tutorial. However, the panohead adjustment procedures are similar. Failure to rotate the camera about the entrance pupil is very likely to result in visible stitching errors. However, do not assume that if you are seeing stitching errors in your panoramas, that these are necessarily due to parallax. You can have your camera perfectly mounted to avoid parallax and still have stitching errors. 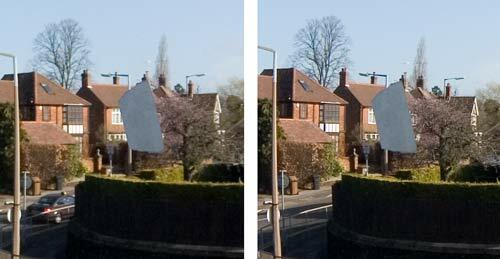 The cause of the stitching errors may be poor correction of lens distortions or badly placed control points in PTGui. Movement of clouds and tree branches etc. can also cause problems. You may be able to minimise the stitching errors or even hide them altogether by intelligent blending - either manually (by editing the layer masks in a layered .psd file), or automatically (by using a blender such as Smartblend). The bottom line is that if you want to check if your camera is correctly set up to avoid parallax, then you should do some tests designed specifically to reveal the presence of parallax. Finding the no-parallax point is not difficult, especially in the case of most single lens reflex cameras, for which the entrance pupil can be readily seen as a bright spot or disc when you point the viewfinder (i.e. the back of the camera) at a bright light and simply look into the lens. Stop down the lens to f/16, say, and hold down the depth of field preview button on the camera (if there is one). With the 3D vision provided by your two eyes, it is easy to judge the approximate position of the bright spot: just move a finger along the lens barrel to a point where it seems to be the same distance away. If you have difficulty seeing a bright spot or disc, just point the back of the camera up at the sky and look into the front of the lens. (With a fisheye lens, it isn't really necessary to stop down the aperture as the spot will be quite small even with the aperture wide open). This leads to a novel method of adjusting the camera position on a panorama head - simply watch the entrance pupil as you rotate the camera and check for sideways movement of the spot. It works well for short focus lenses such as fisheyes. But first, you need to set the position of the camera on the horizontal arm of the head so that the entrance pupil is laterally aligned with the rotation axis. To do this, you can rotate the camera to point vertically down. Then, the axis point of the head (such as the central adjustment screw on the Nodal Ninja 3 head) should be centered in the image frame. You may not be able to focus sufficiently closely with some lenses to make this adjustment, but you could temporarily switch to a different lens. Alternatively, with the head levelled, you can make a visual check of the entrance pupil spot using a plumb line held in front of the lens. The spot and centre of the adjustment screw should be vertically aligned, as shown here. (The thread was taped to the top of the lens simply to take the photograph. You can just hold the thread in a steady hand). The top of the head looks somewhat like a circular saw. In this case, the "teeth" are set for cutting with a clockwise rotation of the saw. This indicates that the entrance pupil is offset to the left of the pano head axis, as viewed from the back of the camera, so the camera needs to be shifted a little to the right. 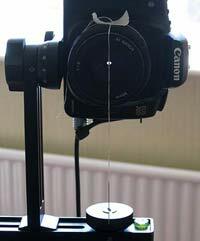 If the saw is set for cutting with a counter-clockwise rotation, then the camera needs to be shifted to the left. The important thing is that the entrance pupil is in the same position at each angle of yaw, e.g. +30 and -30. Any shift of the entrance pupil between the two angles is not important, particularly in the case of fisheye lenses, as explained in the note at the end. Use a sight as before to check that the vertical position of the spot remains the same. It's a good way of checking that the horizontal position is correct too. Comparing the images in Photoshop is generally straightforward. It helps if you layer the images and align them so that switching the top layer on and off reveals the movement of the tape. The camera was rotated L-R for these shots. It is clear that the entrance pupil moved to the right, for you can see a bit more around the right hand side of the tape, and less on the left hand side. This means the entrance pupil was in front of the rotation axis, so the camera needs to be moved back a bit. Take another two shots and repeat as necessary until no parallax shift can be discerned. The close distance of the tape means that it can appear somewhat out of focus with some lenses, making accurate judgement difficult, especially if you also have to contend with the strong edge distortion of a fisheye lens. That problem can be solved by a quick stitch of the two images in PTGui, putting control points only on the background. For output, select only the small central area that shows the tape and generate a layered PSD file. Again, view the file in Photoshop, switching the top layer on and off to reveal any parallax movement. The tape is 25mm wide, so the shift is quite small. Understand that the size of this apparent shift of the tape is virtually the same as the sideways movement of the entrance pupil and is independent of the distance of the tape to the camera. The camera setup is already probably good enough for many purposes. Note that it's very easy to judge the shift despite the tape being somewhat fuzzy, the camera being focused on the background. But let's now correct the camera position to get the best possible result. This looks well nigh perfect, with no discernable parallax shift. Some will regard the stitching process as overkill, but the tests only have to be performed once for a given lens and it's both satisfying and reassuring to know that parallax has been more-or-less eliminated completely. But as already mentioned, you can dispense with the stitching and simply compare the images in Photoshop, or even check for parallax movement just by looking through the viewfinder. If your camera has LiveView, zoom in for a magnified view. It's up to you to be as accurate as you want. The basic method remains the same. Most ring mounts are not adjustable, being set up to suit a particular lens. The Nodal Ninja Ultimate R1 and R10 heads are different in accommodating different lenses and having a fore and aft adjustment mechanism, as well as tilt in the case of the R1. This makes it possible to set the no-parallax point by sliding the camera backwards and forwards, just as is done by adjusting the position on the upper rail of a spherical head like the NN3/5. The techniques for finding the NPP are therefore virtually the same. The only difference is that there is no horizontal and vertical positioning to worry about. 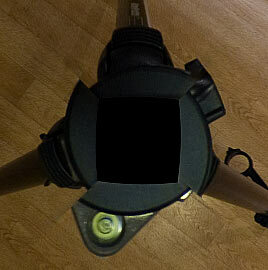 Simply select the angle of tilt required and check for parallax as the head is rotated between detent positions. Move the camera backwards and forwards until the parallax is eliminated, or at least minimised. NB. This position will vary according to the angle of tilt selected. NOTE - FISHEYE LENS CONSIDERATIONS: On the subject of accuracy, you need to be aware that the entrance pupil in a fisheye lens is not centred on a single point. Its apparent position varies for light rays entering the lens at different angles to the optical axis. 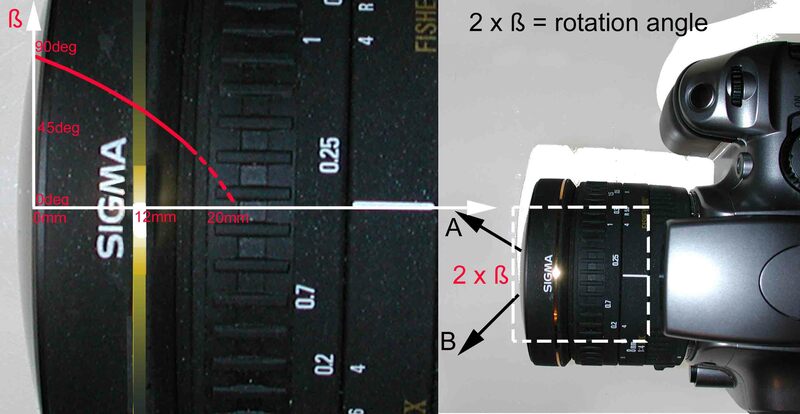 See Michel Thoby's page, which shows how the entrance pupil for the Sigma 8mm f/4 lens ranges over a distance of about 20mm for rays at different angles. The entrance pupil is therefore centred on a floating point that moves about over a surface shaped rather like the flared end of a trumpet, according to the direction of the light rays. It's for this reason that you should adjust the no-parallax position to suit the angles that correspond to the seams in your panorama, where parallax errors are likely to show up. The camera is not rotated about the entrance pupil itself, but about a point which makes the entrance pupil appear to occupy the same position when viewed in the direction at which consecutive shots will be joined - e.g. at 45 degrees to the lens axis for a 4 shots around panorama. While this will be fine for the horizontal parts of the scene, rays from the nadir and zenith regions will be entering the lens at angles approaching 90 degrees to the lens axis, which implies a different entrance pupil location and hence theoretically necessitating a different no-parallax rotation point. The choice of rotation point must therefore be a compromise, but stitchers can usually cope well enough to avoid serious stitching errors. The problem is largely avoided when taking 4 around plus nadir and zenith and joining at 45 degrees vertically and horizontally like a cube.